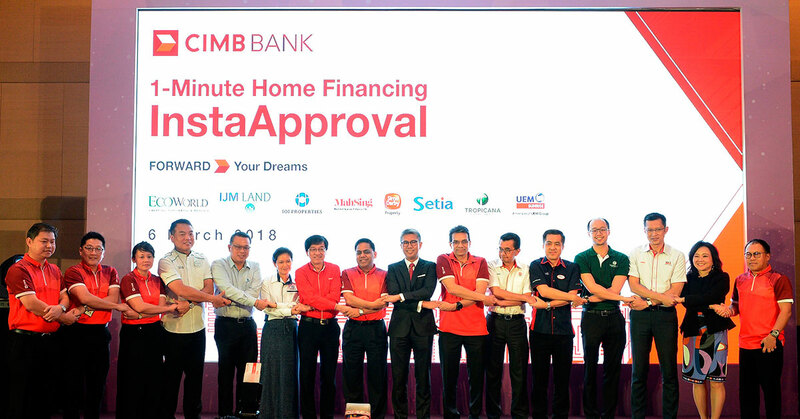 CIMB Bank and CIMB Islamic Bank have just announced the 1-Minute Home Financing service as a new feature to complement their InstaApproval platform. Through the service, potential homeowners will be able to have their mortgage loan applications approved within one minute from submission, provided all necessary paperwork is provided. The service will launch with the participation of eight local property developers through 60 housing development projects through the Klang Valley. CIMB Bank together with CIMB Islamic Bank recently announced an additional feature to their existing InstaApproval platform, which also facilitates applications for personal financing, Amanah Saham Bumiputera loans, and credit cards. Titled 1-Minute Home Financing, the self-explanatory service will allow prospective homeowners to have their mortgage applications approved within sixty seconds upon submission of all necessary documents and paperwork. “We understand that buying a home can be an emotional experience. For many, it is a rite of passage. It may be their biggest lifetime investment,” said CIMB Group Holdings CEO Tengku Datuk Seri Zafrul Aziz at the launch of the new service. The 1-Minute Home Financing service will currently only be made accessible to Malaysians with a salary, and will be available for properties purchased directly from developers at property launches and sales galleries. This—according to Zafrul—will allow prospective buyers to book a property and receive an approval from CIMB complete with an offer letter at a sales gallery in a single visit. “In our aim to become a leading ASEAN universal bank, CIMB has been leveraging on digital in a big way since the start of our T18 mid-term growth strategy in 2015,” said CEO of CIMB Group Consumer Banking, Samir Gupta in a statement. The service will initially launch with the participation of eight local developers and 60 housing development projects scattered around the Klang Valley. The eight developers comprise of Eco World Development Group Bhd, lJM Land Bhd, IOI Properties Group Bhd, Mah Sing Group Bhd, Sime Darby Property Bhd, S P Setia Bhd, Tropicana Corp Bhd and UEM Sunrise Bhd. In statements provided to The Star, many of the property developers stated their approval and support of the service. “We laud this initiative by CIMB and are honoured to be selected as one of the key Malaysian developers to offer this innovative service to our purchasers,” said S P Setia President and CEO Dato’ Khor Jap Chen. “This is an innovative approach that will help purchasers own their dream property,” said Group Managing Director of Sime Darby Datuk Seri Amrin Awaluddin. Looking at the bigger picture, CIMB’s new service comes in the midst of a downward trend that has circled the Malaysian property market. Despite a slight softening in the first half of 2017, property transactions continue to see a decline. But despite the downward trend, CIMB continues to remain optimistic about increasing its mortgage loan business shares. “We have been growing faster than the average market’s growth over the last three years,” said CIMB Senior Managing Director Viprin Agrawal. Viprin also hoped that CIMB’s Insta Approval platform would help them cement their position as Malaysia’s third-largest lender based on market capitalisation. The group recorded between 12% and 13% annual growth in mortgage loan over the last three years and they hope to grab more of the market in the coming year. Ultimately, this service signals yet another way financial institutions are trying to entice house buyers by simplifying the ownership process. Just recently, we covered Maybank’s new rent-to-own home ownership scheme that allows prospective homeowners to rent a property for 12 months before making an actual purchase. But whether or not these initiatives will prove to be effective in the long run, Malaysian property hunters will no doubt be happy to have yet another thing to help them in their search for a new home. For more information on the 1-Minute Home Financing service, check out the news release on CIMB’s official website.